These modules explore different design related topics and draw upon several kind of expertise needed to work on open ended problems and take an active stance in problem formulation and strategic proposition. A deep investigation on how design becomes strategic tying the brand identity with the product features and the distributive strategy. The modules transfer the design tools related to development and the innovation of a service. A deep attention is dedicated to the service ‘tangibilization’. These modules explore, through applicative project and business cases, the design thinking tools supporting the design research and the conceptualization phases. A complete overview of the cultural roots of Italian design showing how different traits are nowadays current and updated (spirit of entrepreneurship, the innovation as a cultural act, the product innovation related to the change of meaning, the observation of user-context). The present modules transfer the main concepts about the marketing process, marketing organization and marketing analytical tools. A particular attention is dedicated to the 4P orchestration and to the innovation perspective based on marketing paradigm. The modules transfer the main concepts related to the strategic planning and to the pillars of the strategic thinking. Deep attention is addressed to how the strategic pillars (mission, vision, SBU, competitive advantages) affect the innovation and design process. The present modules transfer the basics related to project management as a process of resource allocation and goal setting. Specific attention is dedicated to the differences of project management in big and medium companies and in environments characterized by low or high innovation pace. The present modules transfer the concept of technology adoption as a source of competitive advantage. A specific attention is dedicated to technology driven competition, and to the concepts of complementary assets and network externalities. The present modules transfer the concepts related to the roots of entrepreneurial activity, the personal traits of entrepreneur, the startup genesis, the lean start up. An intensive introduction to the design driven strategic options. A great attention is dedicated to the interplay between design and technology evolution. Focusing on the engaging and the management of the array of designers. 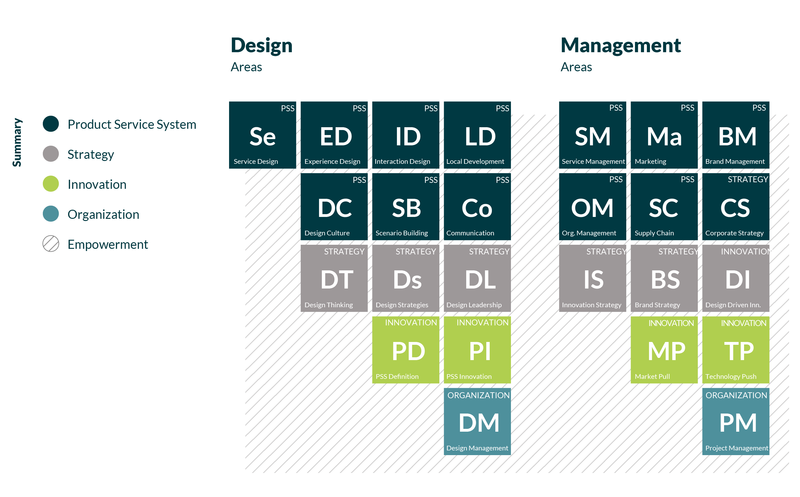 Specifically the modules show the main tradeoffs related to divergent design management options. Innovation is a way to achieve a competitive advantage. Specifically great attention is addressed to the barriers to innovate, to the set of advantages/disadvantages pertaining innovation, and to closed/open innovation paradigms. A specific focus is centered on Design-Driven innovation. A series of modules transfer the main principles underpinning the design and the development of new services. The service paradigm is also used to explain some intangible innovation related to products and tangible objects. The present modules – based on updated research streams – show design-intensive entrepreneurship as a complementary perspective respect to the high-tech based entrepreneurship.